Four pairs for Nike schools. 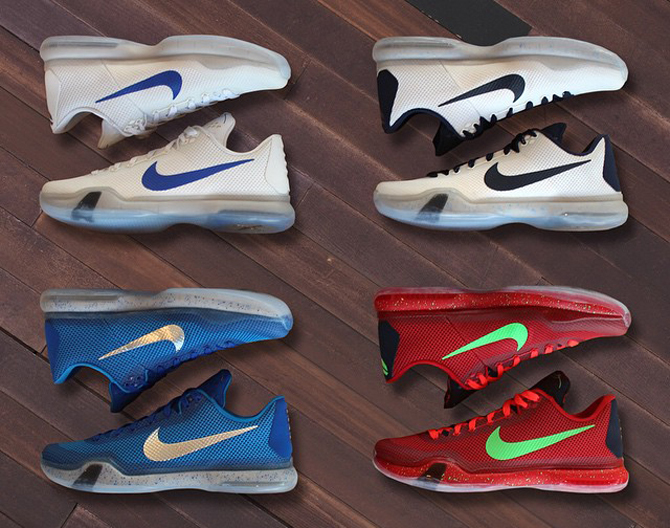 The Nike Kobe 10 is planning to make its mark on March Madness with these exclusive colorways. Some of them actually made their debut before the tournament, but only now has Nike Basketball decided to officially acknowledge the whole group. Clockwise from top left there are pairs for Kentucky, Villanova, Arizona, and Duke. Villanova's loss over the weekend of course means that its pair among them won't be advancing any further. While not shown in this aerial shot, each of the Kobe 10 college exclusives have embroidery under the tongue that mention the name of the connected university.